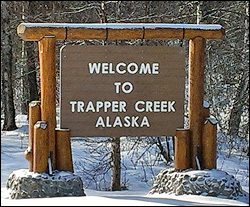 •	Courtesy Biennial Report Notice for Trapper Creek Community Council, Inc.
•	DOTPF Mat-Su Area Planner, Allen Kemplen, will present an update on recent changes to federal funding and discuss the impacts to the current Petersville Road Rehabilitation Project. This entry was posted in Meeting Agendas on May 10, 2013 by Chris Boone. Assembly Report: Vern to attempt to repurpose $70,000 of money left from last year’s budget for connecting and finishing community buildings. Motion made by Glenka to support Vern in trying to acquire said $70,000. Seconded by Leo, approved unanimously. Public Forum: Review and acceptance, for vote, of FY2012 Revenue Share project proposals using remaining funds. •	TCCSA Operating Costs – Requests $4,000 for assistance with phone, electric, heat, etc. 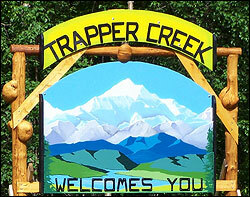 •	TCCC – Requests $1,000 for operating costs. Motion by Glenka, to take without vote, $1,000 of revenue share money for Trapper Creek Community Council operating costs. Seconded by Kolbeck. No by Miller. Council gets $1,000 for operating costs. Date of next meeting scheduled for May 16, 2013 at 6:30 pm. This entry was posted in Meeting Minutes on May 10, 2013 by Chris Boone.